"Mug Shot On The Go" implies something that's very quick and easy to make on the move, possibly between meetings on a busy working day. I'm on holiday at the moment, so decided to simulate rushing around the house by waiting to the last minute to have my lunch and start watching a three part Great War drama about the beginnings of World War 2 called 37 Days. I quickly read the simplified diagrammatical instructions on the container whilst I boiled the kettle, fetched some bread for dunking, and sorted out some fruit for a healthy pudding. I used a metal fork, as there was no free plastic fork, but that didn't matter as plastic forks always get replaced with a solid metal one and the unused plastic variety just ends up cluttering the utensil draw. Remember; plastic bends if used in freshly boiled water, though if you're at work with possibly no utensils available then using your fingers could be rather messy! There was a "Fill line" on the side of the container, but if you require a thinner sauce you could just ignore it and fill the container more. I opted for the thicker orange brown sauce which was lovely with bread dipped in it as it soaked up the thick gooey sauce, which didn't drip too much so was easy and mess free to eat. 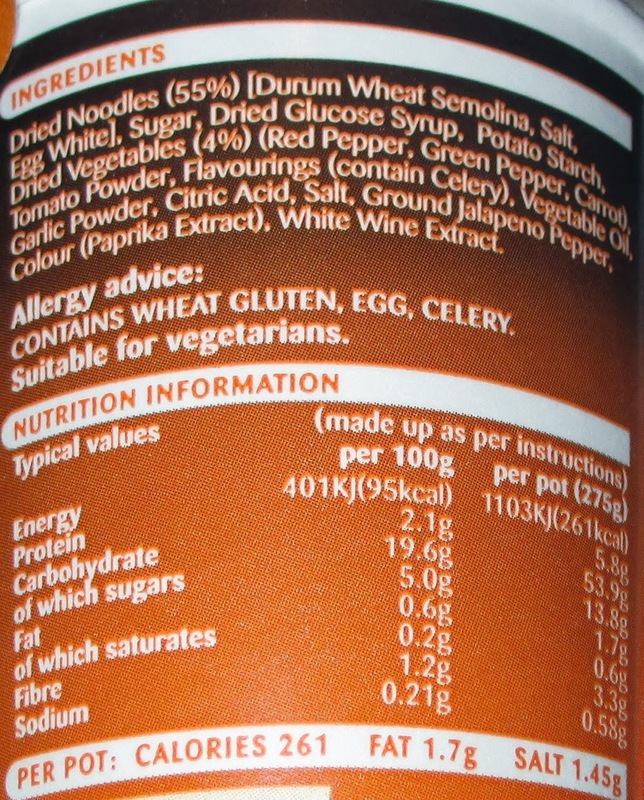 Amongst the thick stringy ribbon noodles there were diced carrots, red peppers and green peppers. The sauce had a spicy sweet and sour flavour with a mild jalapeño pepper chilli heat for an extra added kick. The Ribbon noodles weren't too stringy so I only had to mop my chin once during eating. The sauce was not nose-sweating chilli heat, but it had a pleasant tongue tingling wake-me-up spice that wouldn't leave you a mess in the office or on the run whilst out and about, but would go some way to keep you awake in the following after lunch meeting. The noodles didn't fill to the brim as the serving suggestion on the top of the cardboard container image suggested, but this Mug Shot certainly was nice and filling, especially with dipping a couple of pieces of brown bread. I would definitely have this Mug Shot again and will keep a weathered eye out for any other flavours! Made by Symington's Ltd., in Leeds. Contains Wheat Gluten, egg and celery. 67g pot without water, 275g with water at 261 calories, with 13.8g of sugar and1.7g of fat. No artificial colours or preservatives. Suitable for Vegetarians. Ingredients in photograph. 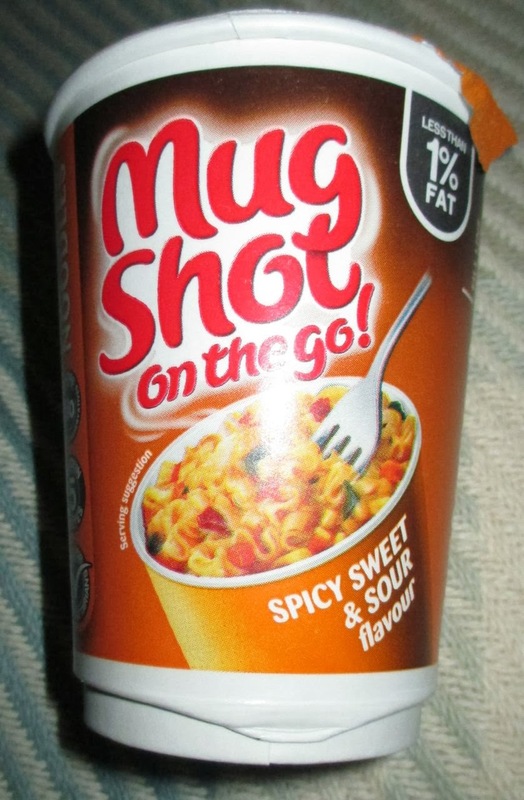 I recommend trying the creamy cheese pasta Mug Shot On The Go !